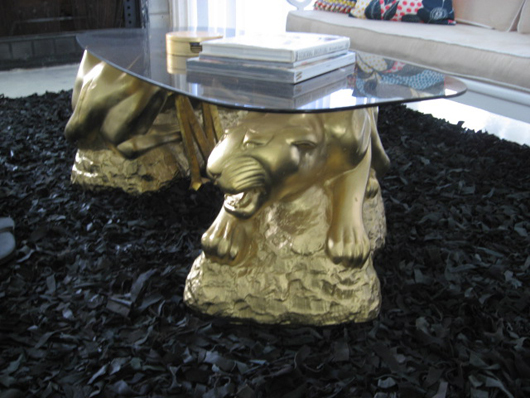 Last Friday my new couch got totally upstaged by my panther coffee table. Yes, my brand new most expensive piece of furniture was put to shame by a pair of panthers purchased from craigslist and spray painted by my mom. So let's talk about them. Note, this is actually a super old picture with my old couch and old rug and tile-free fireplace. I purchased 4 of these panthers from craigslist for a whopping $100. They were black with eyes and mouths painted on their silly faces. I think the rocks under them where gray. They were pretty silly. I bought them from a former bachelor who had, according to him, spent years looking for a panther table only to marry a woman who demanded they vacate the premises. While I may have reconsidered the union, he instead chose to sell them to little old me. I carted them home (breaking one along the way) and made a plan to paint them gold. Before I had a chance to give them the Midas touch, my mom came along and did it for me. Thanks mom. I know these panthers are pretty rad and you probably think there's not much more i can say about them but you would be wrong. 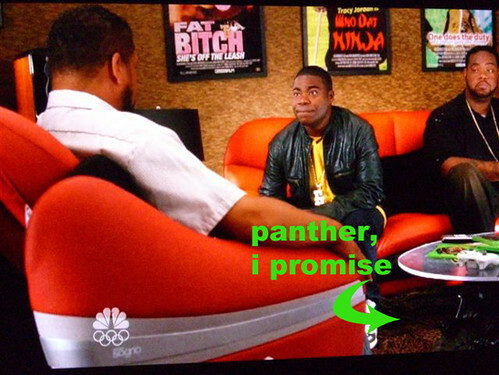 Recently, while watching old episodes of the most awesome show ever made in my lifetime I observed that TRACY JORDAN HAS THE EXACT SAME PANTHER TABLE IN HIS FREAKIN DRESSING ROOM. Ok, his are black, but that's fine, because TRACY JORDAN HAS ALMOST THE EXACT SAME PANTER TABLE IN HIS FREAKIN DRESSING ROOM. I wish to all things holy that I had paused and taken a screen shot but I didn't have the foresight to realize it then and now the only episode I saw them on is a distant memory (I had a 3 season marathon and it's all a blur). This is the best picture I could find online. Find me a better picture and I'll think of something crazy nice to do for you. Before I hit the road, I want to apologize for this quasi lame post BUT BUT BUT, I'm working on a big huge post for Thursday that involves a big surprise announcement that's not to be missed. Unless you have the option of taking the day off work and going shopping or swimming, then I would probably miss the surprise in that case.